Where is the future of theatre? Certainly, nothing will replace the experience of live theatre. Dressing up, getting dinner, meeting friends and seeing a show in a room full of other people having the same, shared experience can’t be replicated (yet! VR is getting there…). However, more and more new avenues are available to playwrights (and storytellers of all kinds, really) to create, fund and distribute their work to audiences hungry for new voices and fresh perspectives. 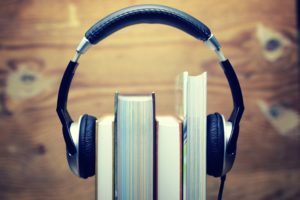 One recently announced new path comes from the world of audiobooks. Audible (the Amazon-owned digital audiobook company) has announced that it has set up a $5 million fund to commission new work from playwrights. Perhaps the future of theatre is on your mobile device? The expanding horizons of available distribution methods for creative content can sometimes be intimidating. After all, isn’t theatre meant to be experienced live? Absolutely! But like the world of music, wider distribution of your work to audiences around the world can help encourage a deep love and commitment. This, in turn, makes it more likely your audience will commit to coming live performances when the opportunity arises. The advent of easily available streaming music services certainly hasn’t hurt the concert industry, and indeed has made it far more likely that people will be willing to invest large chunks into an experience of something they already love. Grants will be offered to about a dozen playwrights to start, chosen by an advisory board of award winning theatre veterans. The grants will allow playwrights who might be self-funding (for most this means hustling a “day job” while writing in their spare time) to be paid to write plays. Talk about taking the starving out of artist. We salute you, Audible!